Soft robotics can emulate cardiac motion. Here, I will outline a new way to replicate and understand how the heart functions, with a view to creating future devices to assist the heart in patients with heart disease. This is important as if we can recreate the motion of the heart in a computer model, or on a benchtop model in the lab, we can create better devices to assist the 22 million people living with heart failure worldwide. The heart twists as it beats. This notion has been represented in multiple videos and has received awards and recognition, even inspiring dances. The way the muscles are arranged in the heart (see Figure 1) promotes twisting which allows more effective filling and ejection of the heart (like the wringing of a towel). The idea of cardiac twist could be a useful tool for clinicians in their assessment of cardiac function, or perhaps for an implantable sleeve that assists the heart with twisting and pumping. My research is focused on using soft robotics to imitate and assist with repairing the heart. Here, I will describe how we went about using robotics and soft materials to mimic cardiac twist. Figure 1: Twisting heart: Opposing rotations at different parts of the heart result in an overall cardiac twist. Soft robotics is a rapidly growing research field that combines traditional robotics with inherently soft and compliant materials such as silicone and rubber elastomers. 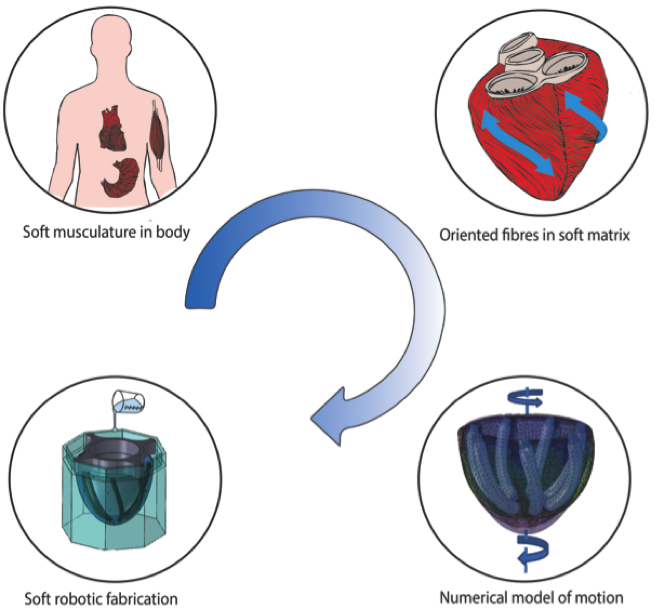 The field of soft robotics is driven by new scientific paradigms including imitation of biological phenomena and smart materials as well as multiple applications involving human/soft tissue interactions. Such soft systems can be engineered using low-cost fabrication techniques (e.g. molding), and are ideally suited for interacting directly with humans, for example in medical applications. In particular, pneumatic and hydraulic powered elastomeric soft actuators are promising candidates for mimicking biological motion (or heart motion in this case) because of their lightweight, high power-to-weight ratio and low material cost. In addition, these actuators are easy to fabricate with emerging digital fabrication techniques and can be controlled with single inputs that result in complex motions (for example wearable robots). Upon pressurization, inflatable chambers in the soft actuator expand and give rise to bending, twisting and extending/contracting motions. Muscle has been referred to as the “prototypical soft actuator” because it can achieve fast, strong actuation and an extraordinarily complex range of motion. We can look to muscular structures in the human body for inspiration on how to fabricate soft robots to achieve lifelike motions. There are an abundance of examples of soft muscular systems that can achieve intricate manipulations; among these are the stomach, tongue, diaphragm and heart. As depicted in Figure 2, complex motion in soft muscular structures is often achieved through the functional arrangement of multiple simple contractile elements arranged spatially in a soft matrix and actuated at precise times. By building materials that are fully soft with embedded, simplified arrays of contractile elements that mimic this biological form/function relationship we can rapidly and cheaply achieve structures with motion similar to that of biology. Furthermore, if we develop approaches for numerically simulating such soft hybrid materials we can improve the material and geometric properties of actuators and surrounding structures to achieve desired movements. This replication of motion can greatly enhance our understanding of the motion of organs in the healthy and diseased state, and can provide information on optimal ways to assist with diseased motion to restore organ function. Figure 2 Moving clockwise from the top left, we can look to soft muscular structures in the body for inspiration. Specifically in the heart, multiple simple fibers are arranged in a specific orientation to achieve desired motion. We can use numerical models to predict the motion, and guide design, then fabricate the soft robots using molding techniques. The physical and numerical replication of the heart motion both serve to understand the way the heart moves in the healthy and diseased states, and how this relates to its function. In work published earlier this year, we showed that we could recreate heart motion in a computer model and in a soft robot. Our inspiration was the structure and dominant muscle layer of the muscle fiber architecture of the left ventricle of the heart, a muscular structure capable of achieving complex motion through oriented contractile elements. During the contraction phase of the cardiac cycle the apex of the healthy left ventricle rotates anti-clockwise approximately 7° when viewed from the apex while the base (top) of the heart has a net clockwise rotation of approximately 4°. Figure 1 describes the resultant complex left ventricle twisting motion, with the apex and base rotating in opposite directions. Twist is governed by parameters including orientation of the heart muscle fibers and the balance between the contraction of the outer and inner fibers which are arranged in opposing helices. 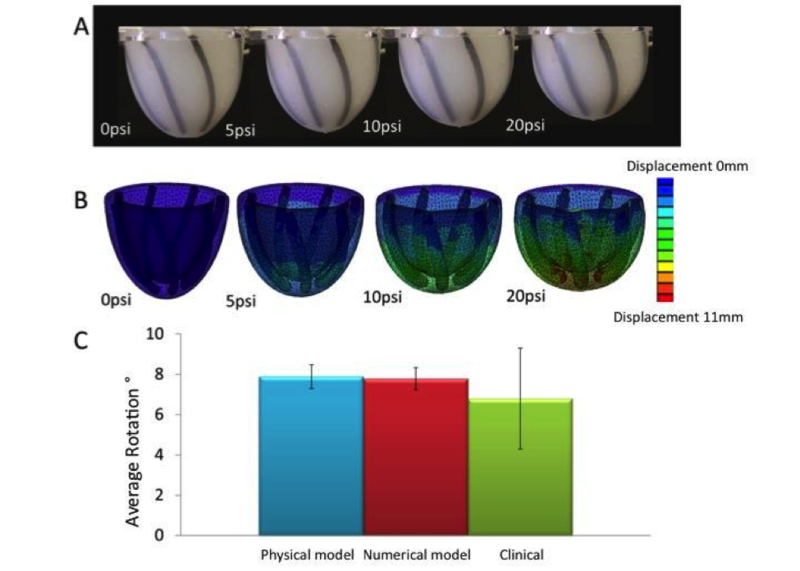 In this study, it was demonstrated that by mimicking the orientation of the contractile elements in a soft elastomeric material in shape similar to the left ventricle, an accurate representation of apical twist could be achieved. 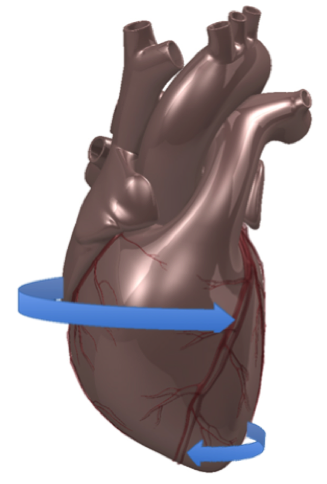 Due to the fact that twist has an important impact on the performance of implantable cardiac devices such as artificial valves, an ideal bench-top cardiac simulator would mimic the soft and active contractile motion of the natural heart tissue and be capable of replicating both healthy and diseased motions. Finding mechanical devices that can effectively act as muscles is not an easy task. Many devices that provide force, such as motors, are rigid and can heat up so placing them near the heart can be a problem. We chose to use small balloons with external meshes, otherwise known as McKibben pneumatic air muscles (PAMs) as the actuators for this application. These are the most highly developed and studied class of soft actuators. They consist of an inflatable balloon surrounded by a braided mesh. We selected these actuators for a number of reasons; (i) they can be modified to be fully soft (ii) they actuate at low pressures (iii) they can be actuated quickly and (iv) they can be easily molded into structures. PAMs have one mode of actuation but if arranged spatially in a matrix according to a desired function, they can result in more complex three dimensional resultant motions. The figure above shows some of the achievements of the work. Figure 3a shows the physical prototype that was fabricated. As the actuators are inflated to higher pressures, the structure twists and shortens. A three-dimensional numerical model was was created with identical dimensions, and showed very similar motion (Fig 3b). Motion of the physical model was tracked using trackers placed in the soft robot at the top and bottom of the heart. Fig 3c shows the comparison of the physical model, numerical model. The numerical model predicts a rotation that matches the measurements on the physical prototype . Both values fall within real life clinical values. This is a key result that demonstrates the applicability of this using soft robotics to simulate cardiac rotation for applications such as cardiac simulators and potentially cardiac assist devices. It hasn’t been done before with soft robots, as it is a relatively new field. In conclusion, if we can use soft robots to accurately imitate biological motion we can better understand the healthy and diseased motions of organs. Then we can build sophisticated test-beds and move towards atraumatic, conformable implantable devices that assist or enhance biological motion. Ellen Roche is a 2011 fellow of the Fulbright Science & Technology Award, from Ireland, and a PhD Candidate in the School of Engineering and Applied Sciences at Harvard University. The September edition of TGS magazine was co-edited by Ronan Killian McGovern, a 2010 fellow of the Fulbright Science & Technology Award, from Ireland, and a PhD Candidate in the Mechanical Engineering Department at MIT. ← How will East Africa address its food crisis?